3.9 out of 5 based on 37 bloggers and 4 commenters. 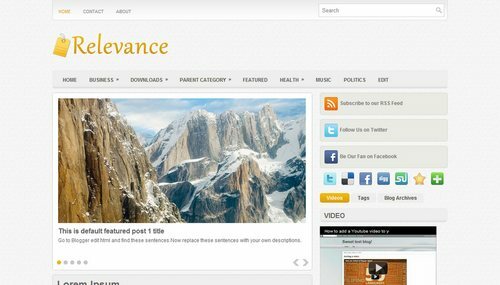 Relevance is a free blogger template adapted from WordPress with 2 columns, magazine-styled, left and right sidebars, rounded corners, ads ready, slider, posts thumbnails, tabs, drop down menu, pagination and neutral colors. btemplets is a very good site for blog templets, I like it very much. demo template is off line!!! @Claudia: Thanks for your reply, Claudia. All is already fixed.